Two of the base’s existing VAQs required upgrades of the infrastructure, interiors, and egress, as well as complete replacement of the windows. 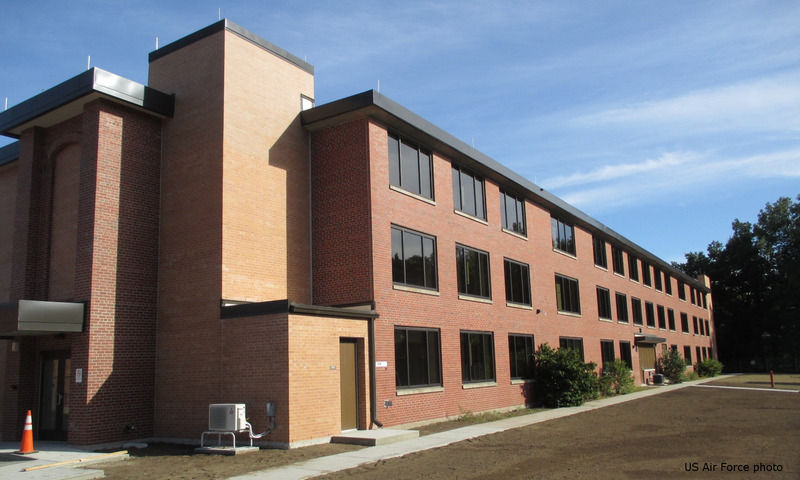 Full-height, enclosed elevator and stair egress additions were constructed at both ends of each 3-story building, increasing the area of each builiding by 3,300 square feet (SF). A blast evaluation and a dynamic nonlinear progressive collapse analysis were performed in accordance with the current Unified Facility Criteria (UFC) requirements. Based on the results of the evaluation and analysis, blast-resistant window frames and connections were designed and detailed. To comply with the progressive collapse requirements, glass and carbon fiber reinforcement were selected to strengthen the cast-in-place concrete structure. In addition, a full seismic analysis was completed in accordance with ASCE/SEI 41.